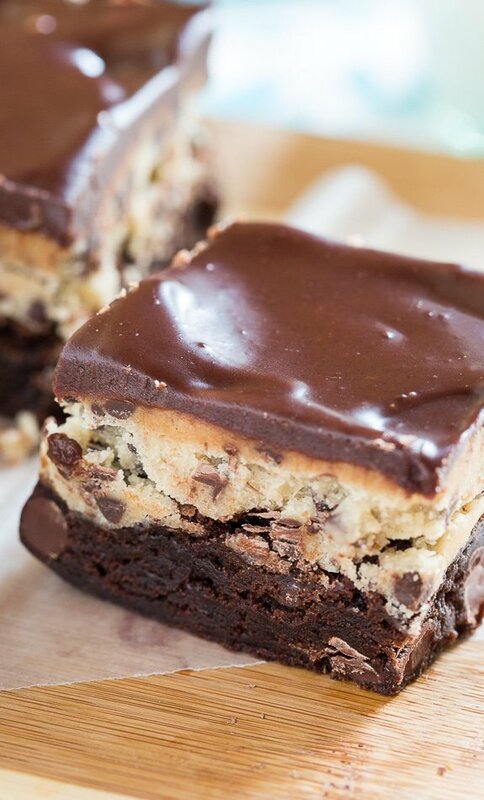 Cookie Dough Brownies have a fudgy layer of brownie, a thick layer of cookie dough, and a chocolate glaze. So thick you might have to eat them with a fork! It’s finally flip-flop weather in South Carolina! My long lost friend, the sun, is back and that makes me so happy. 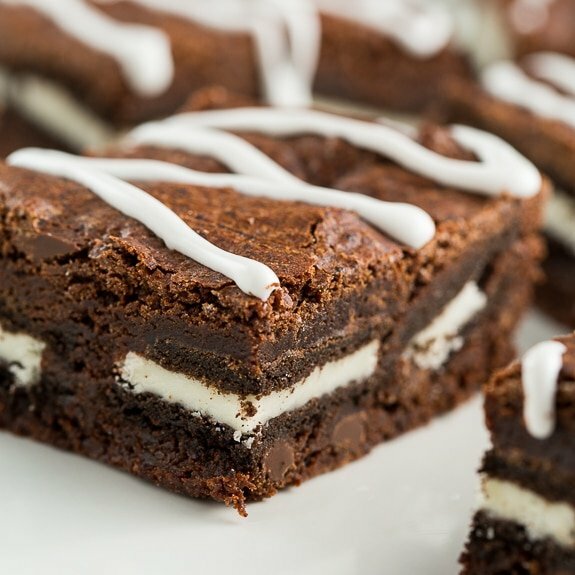 And when I’m happy, I want brownies and these aren’t just any ordinary brownies. They are special enough for celebrating the arrival of spring. Super thick Cookie Dough Brownies are brownies for cookie dough lovers. On the bottom is a fudgy layer of brownie. To make it easy, I used a box of Ghirardelli Brownie Mix. Once the brownies are baked, a layer of cookie dough is spread on top. It doesn’t get cooked, but don’t worry. It doesn’t contain eggs. The cookie dough has bunches of mini chocolate chips throughout. 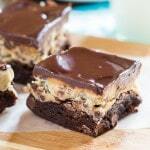 These Cookie Dough Brownies are finished with a layer of chocolate glaze on top. Because you can NEVER have too much chocolate. Make brownies in a 9x13-inch pan according to package instructions. Let cool completely. To make cookie dough, beat butter, brown sugar and granulated sugar with an electric mixer until combined. Beat in milk and vanilla extract. Mix in flour and salt just until combined. Stir in chocolate chips. Spread cookie dough layer on top of cooled brownies. Refrigerate or freeze until firm. To make glaze, place chocolate chips in a small bowl. Bring cream and butter to a simmer in a small saucepan and pour over chocolate chips. Let sit 15 seconds and then stir until smooth. Pour glaze on top of cookie dough layer. This entry was posted in Brownies and Bars, Desserts and tagged brownies, chocolate. Bookmark the permalink. 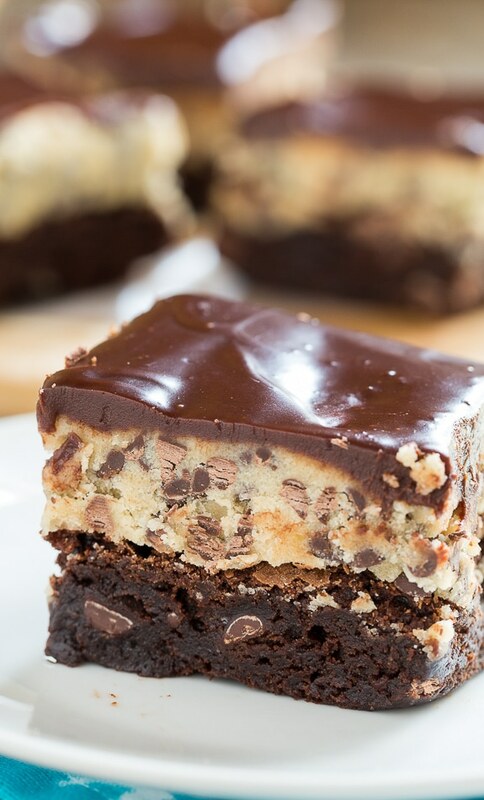 I need some cookie dough brownies in my life. NEED. Every time I come to Spicy Southern Kitchen.. I get hungry! 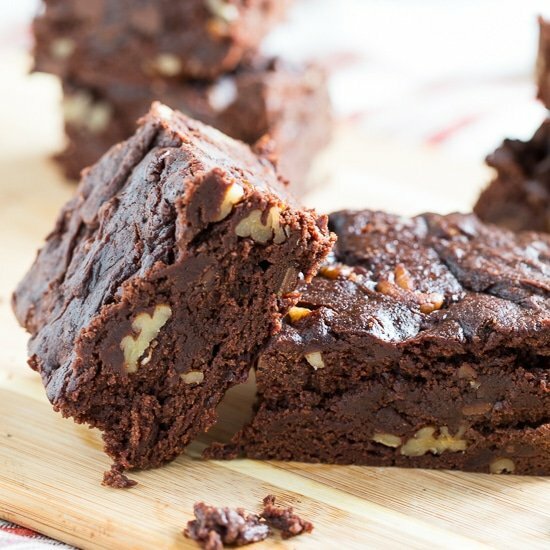 You just have got me salivating over these brownies Christin. Seriously does it get any better than cookie dough brownies? I am so excited for the warmer weather and spring too! These cookie dough brownies are the perfect way to celebrate! Love all those layers! This is perfection here! Look at those layers – ooh I just wanna sink my teeth into them! OMG!!!! I love these brownies! I am also jealous of the flip-flop weather! There will be no flip flops for at least another month for me 🙁 I’ll just have to drown my sorrows in a pan of these brownies!!!! Oh my goodness – that is insane! Looks so divine and yes, more more chocolate, please!! It is raining here today but we’ve really turned the corner on the weather (fingers crossed)! I agree you can never have too much chocolate.. 😀 these brownies look gorgeous! Yay for flip flop weather! And just when I didn’t think brownies could get any better, you added a layer of cookie dough. Perfection! I love that it is finally warmer out! I say these are a great way to celebrate! I am with Galye—-sign me up for these brownies! I am not much of one for brownies, but this one is THE exception to the brownie rule. YUM! I need these now! Cookie dough on top of a brownie sounds like a great idea! I need to try this ASAP. Have a great weekend, Christin! I am sooooooo happy spring is right around the corner! Break out those flip flops! These cookie dough brownies are the perfect way to celebrate! I’ll have 12 please! Cookie dough brownies?! Sign me up! These look amazing! Love the mashup!